The old fashioned coconut pudding recipes featured below call for the all-natural, fresh taste of coconut. Whether you obtain your coconut meat the traditional way by cracking open a coconut or buy it already shredded, you'll love these easy-to-make desserts. 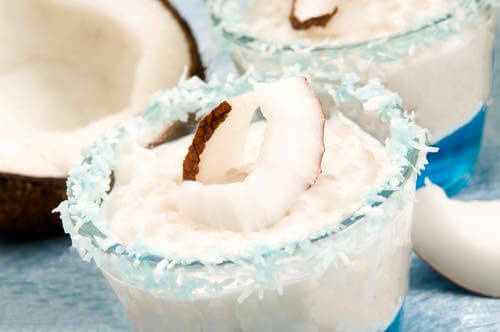 Coconut was a popular flavoring ingredient in the late 1800s as coconuts were easy to ship and did not require refrigeration, and it remains a popular flavor in desserts today. Kids of all ages love its fresh, chewy taste. So indulge yourself. Make a delicious pudding today. Many kinds of puddings can be made with this receipt by adding different flavorings. I consider it a great success; besides, it is very easily and quickly made. It may or may not be served with a boiled custard made with the yolks of eggs. Ingredients: One pint of rich milk, two tablespoonfuls of cornstarch, a scant half-cupful of sugar, whites of three or four eggs, a little salt, flavoring. Beat the eggs to a stiff froth. Dissolve the cornstarch in a little of the milk. Stir the sugar into the remainder of the milk, which place on the fire. When it begins to boil, add the dissolved cornstarch. Stir constantly for a few moments, when it will become a smooth paste; now stir in the beaten whites of the eggs, and let it remain a little longer to cook the eggs. It can be flavored with vanilla and put into a form; yet it is still better as a coconut pudding. When the preceding pudding is just finished, add half a coconut grated; put it into a mold. Serve with whipped cream around it, or a sauce of boiled custard made with the yolks of the eggs. Melt over the fire butter the size of an egg, with a cupful of sugar, and a tablespoonful of water. Pour them into a dish when they have boiled a couple of minutes, and let them cool; mix with them half a coconut grated, a tablespoonful of small cuts of citron, the grated rind and juice of half a lemon, and the yolks of four eggs beaten separately; add the whites (beaten to a stiff froth) the last thing. Fill little paper cases [or paper muffin liners] and bake immediately. They may be served hot or cold. Of course, it may all be baked in one dish; but it makes a very dainty course to serve one of these cases placed on a plate for each person. Half a pound of grated coconut. Then mix with it half a cupful of stale sponge cake, crumbled fine. Stir together until very light half a cupful of butter and one of sugar, add a coffee-cupful of rich milk or cream. Beat six eggs very light and stir them gradually into the butter and sugar in turn, with the grated coconut. Having stirred the whole very hard, add two teaspoonfuls of vanilla; stir again, put into a buttered dish and bake until set, or about three-quarters of an hour. Three of the whites of the eggs could be left out for a meringue on the top of the pudding. Most excellent. One quart of milk, three tablespoonfuls of cornstarch, the yolks of four eggs, half a cupful of sugar and a little salt; put part of the milk, salt, and sugar on the stove and let it boil; dissolve the cornstarch in the rest of the milk; stir into the milk and while boiling add the yolks and a cupful of grated coconut. Flavor with vanilla. Frosting: The whites of four eggs beaten to a stiff froth, half a cupful of sugar, flavor with lemon; spread it on the pudding and put it into the oven to brown, saving a little of the frosting to moisten the top; then put on grated coconut to give it the appearance of snowflakes. Coconut meat prepared from scratch always tastes so much better than the processed store-bought kind, and you get to drink the ambrosial coconut water too. A short video and step-by-step instructions reveal the secret of how to open coconut shells almost instantly. After you've watched the video, return here to choose one of Grandma's coconut pudding recipes and prepare a special treat to enjoy.